Word Trek is a brain puzzle game, developed by PlaySimple Games and is an interesting mix of a word search and a puzzle game. The first levels of the game (3×3 grids) are so easy, you almost never get stuck. But as you get on the other levels the difficulty increases. Finding the right words becomes quite hard, so you get stuck and cannot play anymore. With no further ado, here is the image and the answers you requested. If you want to search for other answers, just use the search form below. Enter the first 4 letters you see in the grid (or more letters to get better results). Lets make an example. Suppose you want the answers to the above puzzle. You can enter in the search form 4 letters EACT, than hit Enter. 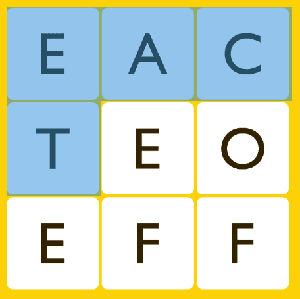 Or you can enter just 3 letters then select the grid size. Note: if you enter 4 or 5 letters, the results will be exactly what you’ve been searching for. Actually “word up” and “word trek” are the same game. For some unknown reasons the developers changed the name from word up to word trek. So you can still use our website to find the answers to word up game. Word trek has many more levels than word up, since a lot of updates have happened in the passing weeks. Welcome to WordTrekanswers.net website. In this website you can find all the answers of WordTrek game. WordTrek is a brain puzzle game, developed by PlaySimple Games and is an interesting mix of a word search and a puzzle game. More..